We loved the blog, Please Play in the Street: Urban Design for the Commitment Phobe in All of Us. It talks about the importance of designing public spaces that provide for the needs of multimodal users. In 2011, the Rosslyn BID initiated Arlington’s first Parking Day (Koch discusses Parking Day in her blog). We’ve been sponsoring Parking Day in Rosslyn for the past five years. Separately, we’ve been conjuring up lunchtime respites on traffic medians and creating pop-up parks out of parking lots and construction zones. 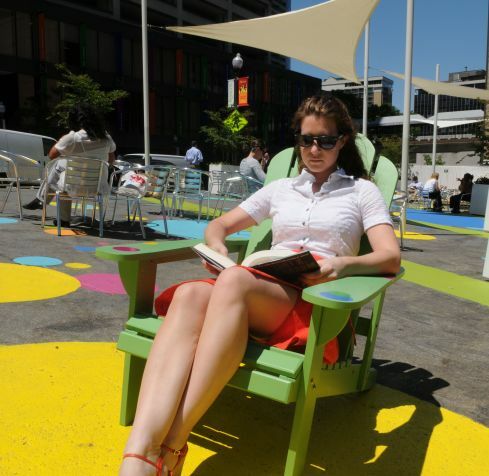 Our Adirondack chairs are like movable fun spread throughout Rosslyn. We’ve found that people appreciate any place where they can sit down and chill, especially in a busy urban center. Even when posted in unlikely spots, such as in front of a gas station near a busy intersection, the chairs are frequented by tourists, students, office workers and mothers with children. We are currently working with Arlington County on ways we can make Rosslyn’s streets even more lively with a pop-up “parklette” we’ve designed as part of our Streetscape Elements Plan. It’s taken from a model that is currently adding valuable seating space to the streets of New York. Stay tuned for more info on that. We couldn’t be more excited! And now, here’s the full text of that terrific blog. Enjoy!